It’s now officially too late to wish happy new year to anyone. But it’s not too late to review your marketing playbook and stack, to make sure you’re getting the results you need from 2019. The marketing landscape keeps changing rapidly, and there are areas where you simply need to keep up. Many of the tactics, tools and product features that did the trick in 2010 or even 2015 have stopped working. And there are lots of new trends to get lost in – voice search, VR and so on. How do you navigate the chaos of a changing marketing landscape? I believe that the best way to manage is to focus on the most fundamental building block of any business: creating a great experience for your customers. By using your customers as a compass, you will be better positioned to make good decisions about your product, your marketing strategy and even the tools you use. Growth hacking can drive insanely good results. And you already know that fortune favours the bold, that many successful tests can create initial user pushback, etc. Which I wholeheartedly agree with, but to which I’d add that short term results shouldn’t come at the expense of user experience. A quick way to get more email leads is to greet every web visitor with a popup you can’t close. But it would also piss off your audience, some of them to an extent that they never return. They might even post angry screenshots about you. As much as I like Growthhackers.com, I find it super annoying that I’ve had to opt out of their on-site push notifications at least 10 times in the last year. 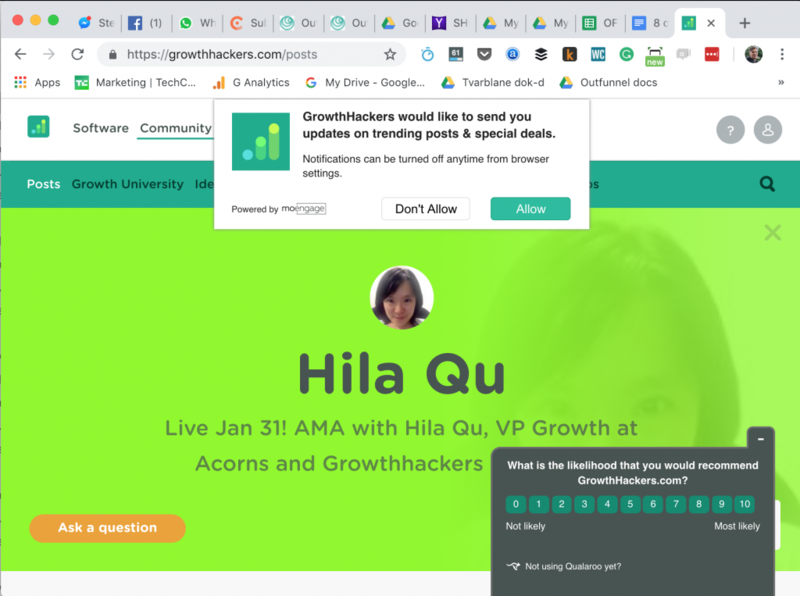 My 11th or so press of “Don’t Allow” on GrowthHackers, further spiced up by the NPS popup. While this wasn’t quite as reputation-destroying as some of the other tactics I’ve seen, we decided to kill that popup. We’re better off with fewer email leads but a smarter-perceived brand. Do you have a process for evaluating the “collateral damage” your growth experiments are generating? You probably don’t want to spend too much time on this, but be sure to consider the trade-offs to your users. You want to send out a marketing newsletter. Simple enough, right? Unfortunately, the current database of marketing leads is out of date. So now you need to bug a developer or analyst to extract the correct database. You hope and pray that they’ve saved the SQL query from last time. The whole process takes a couple of hours, if you’re lucky. And you repeat this month after month! To avoid this problem, you want to get into the habit of thinking clearly about how you’re spending your time. If you’re making $100,000 per year, your hourly rate is about $50/hr. If a $49/month tool can save you an hour per month, you’re already ahead, because you can probably do something more productive with that hour. If it can save you an hour per week, the ROI is already in the triple-digits! So I’m a big fan of tools that measurably save time, and we’ve tried to build this into Outfunnel, too. For example, we use Outfunnel ourselves to send out emails to both customers and non-customers. “Prospects” is everyone that doesn’t have a paid account and has given us a permission to email them. We send them useful content and major project news. “Customers” have a paid account with us, and we keep them up-to-date with all product updates. Outfunnel helps to reduce the time wasted on pulling email lists. Whenever I want to send an email to either group, all I have to do I just open up Mailchimp, compose an email and hit “Send”. Even if we’ve gotten hundreds of new contacts since the last newsletter, I can confidently trust that our email lists are up-to-date – as long as Pipedrive, our CRM, is up-to-date too. Here’s another example: I was unpleasantly surprised when the social media tool Buffer recently announced that they’d discontinue their weekly statistics email. For me it had been a great way to learn which tweets had gotten good engagement, and which ones had flopped. Now I’d have to log in to the tool and navigate to the analytics view of two different Twitter accounts. Buffer is not saving me as much time as it used to. 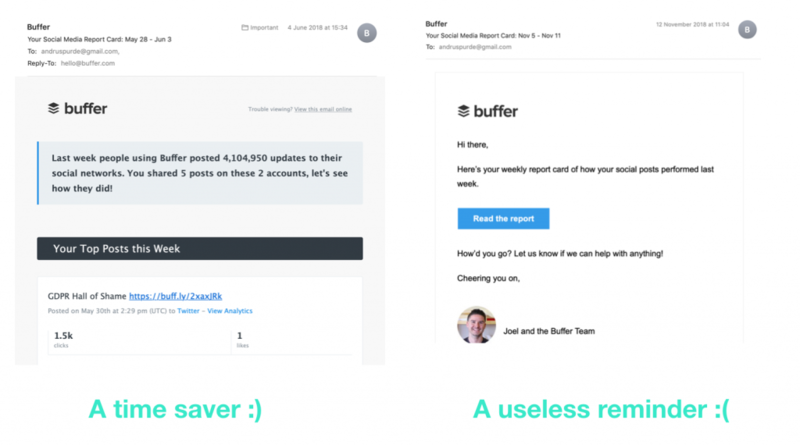 Buffer weekly email: before and after. What are the repetitive marketing tasks that you and your teammates are wasting time on, month after month? Can you identify opportunities where such repetitive tasks might be replaced by some simple automation, eg. auto-populating your email list? At this point, you’ve figured out that you would benefit from doing some marketing automation – perhaps you’ve decided you could save some time with a better email solution. So you start searching for email marketing automation tools. There are dozens of options! And this is true for any aspect of marketing automation. 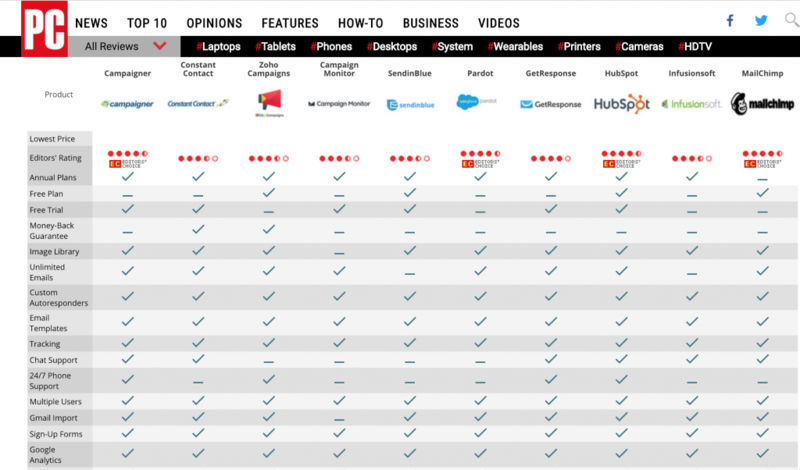 Thanks, PC Mag, for making it so easy to pick email marketing software.. If you look at the features pages of providers, most tools appear the same. But in practice, there are meaningful differences. Each email-sending tool has a different “product DNA”. There’s typically one thing they’re great for, and are the other use-cases are often bolted on – which is extremely frustrating for users with specific needs. Lots of email tools today were created at a time when email marketing was mostly about sending beautifully designed newsletters with dozens of templates to be read on laptops and desktops. Even after many subsequent feature launches, their product DNA is still optimised primarily for this model of email marketing. Then, there are email tools with product DNA optimised for sending email sequences based on usage, or cold email sequences to prospects or automated emails based on actions taken (or not taken) on an ecommerce platform. How do you discern the product DNA of a company? Don’t just look at the features page – also look at the about page, and the customer case studies, and the blog. You’ll want to get a sense of their priorities and concerns. 4. It’s easier than ever to send terrible “personalized” email sequences – so invest in copywriting! The good thing about modern email tools is that it’s easier than ever to create and send personal-looking email sequences. The bad thing about modern email tools… is that it’s easier than ever to create and send personal-looking email sequences. Because it’s easy, anybody can do it. And so everyone does, but the majority of these people are (a) in a hurry, and (b) horrific writers. Which explains a big part of a common frustration of these modern times: we’re all being bombarded, not just with bad emails but lots of bad emails. I have a golden rule: spend as much time crafting a message as you think a reader would spend consuming it. If you expect the recipient of your informative email to merely glance at it, there’s no reason to make it an example of 21st-century short-form literature. But if there’s a chance that recipients will properly engage with your email, make sure it’s worth it. What happens if your email goes out to 10,000 people? You can afford to, and you probably should, invest 10,000 times more into this email or sequence. Read up on good writing and plan many hours and at least 2-3 revisions for each email. If you have the budget, have your emails crafted or reviewed by the likes of Val Geisler, Copyhackers or your friendly neighbourhood copywriter. Remember GDPR craze that culminated on May 25th of last year? (For people outside Europe, GRPR is data protection regulations that affect all European companies and also any companies that target Europeans). Massive fines were introduced, millions of tick boxes added, thousands of emails from companies you once bought a packet of chewing gum from received (and deleted), new workflows and processes were set up. And then… silence. Companies that were not 100% GDPR-compliant were not fined. In fact, when we recently made some legal disclaimers about not being fully GDPR compliant in relation to fundraising, the lawyers we were working with said that none of the companies they knew (and they know many) were 100% compliant. You may have noticed some companies going back to their old ways. Just last week I received a newsletter from a mid-tier UK VC firm, and when I clicked “why did I receive this”, the response was “because you are connected with one of our employees”. Respect your users. Don’t be the first company that gets a massive GDPR fine. The fact that there have been no public hangings yet, doesn’t mean that it’s okay to go back to the old ways. At Outfunnel we’re climbing towards 100% of GDPR compliance and we recommend our customers to do the same, because hidden behind all the bureaucracy is a useful principle to take good care of people’s data and not send spam. Chatbots have been around for ages but it’s only in the last year that they’ve appeared literally everywhere. 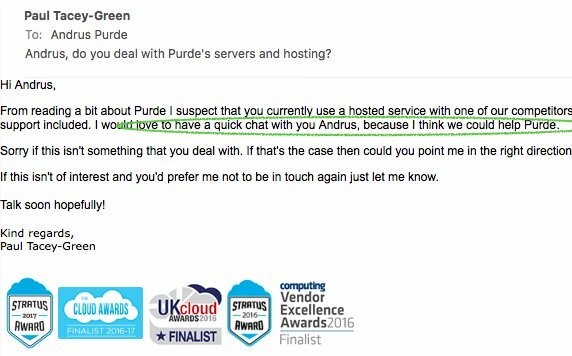 For things like customer support they’re a godsend – the ease of response means that customers who don’t bother sending support emails can sometimes be likelier to respond to a chatbot. Chatbots can help to lower support costs and improve response times. But they’re not great for everything. The common thread I keep seeing is companies setting up their messenger bots to answer incoming queries with the highest volume. But if your top query is “how do I file a claim” is the right answer to program a bot to answer this, or to improve your website structure and usability? Do you treat the symptom or the cause? If you continue along the “chatbot replies to most frequent queries” route, you may end up with a crappy website that relies on a bot to take care of some deficiencies of the site, but not all of them, and you may end up with 2 disconnected navigations. I’m all for bots, but I’m also convinced that many companies are better off investing in improving their website rather than getting more bots. If you are using bots, what are the most common queries and replies that they receive? Are you taking any steps to make life easier for your prospects and customers before they talk to the bot? It’s well-known that your email list is an asset. Grow it, enjoy the benefits of it and don’t do anything stupid like use it all up in a weekend. Now, with other marketing channels getting really expensive and/or turning into walled gardens (more on that below) it’s sensible to over-invest in email marketing, and deploy what I sometimes call inverse strategies. Conventional wisdom is to grow an email list. Smart marketers also invest in deleting people from their email lists. Namely, trimming people that haven’t engaged with emails for a long time. This increases deliverability and accuracy of your email reporting, as well as reduces your email budget. Smart sales teams already target prospects that open and click emails. An inverse strategy to add on top is to go after negative email engagement signals like unsubscribes and bounces. Unsubscribing from a marketing email can mean one of many things: that (a) someone has opted for a competitive offering, or (b) found your email marketing uninteresting, or (c) found your latest email so convincing that they don’t need any new information. Whatever the reason, it’s a great reason to contact that prospect and find out. Email bounces usually mean that someone has changed their email address, and perhaps changed jobs. This means that you may want to (a) find out where they left to and initiate a new sales opportunity, or (b) find out who’s the replacement and make sure the work done so far wouldn’t go to waste. Are you still sending emails to non-responsive prospects who haven’t engaged in a long time? Do you have “inverse” workflows in place for people that unsubscribe, or whose email address bounces? Last but not least. Paid ads are getting more expensive and achieving worse results. Organic social media reach has been falling on multiple platforms. Search engines solve an increasing number of queries and competition is high. Whatever you’re selling and whoever you’re selling to, the best long-term marketing bet is to invest in your brand. Whatever you’re selling and whoever you’re selling to, the best long-term marketing bet is to invest in your brand. If your marketing plan is too acquisition and lead generation focused, your competitors will overtake you in a year or two. Your marketing plan should include things like brand advertising, thought leadership and extreme top-of-funnel content, PR, events, community building. Yes, the short-term ROI on them is lower than for buying more Facebook ads right now, but you probably can’t afford to not think long term. A Facebook ad might get you a bunch of clicks today, but truly great marketing builds you a lasting reputation that compounds over time. There’s always something new to pay attention to in marketing, and hopefully you got an idea for a tactic or a tool from this post. I also hope I was able to illustrate why, in addition to following the new, it’s beneficial to deeply re-examine the basics. It pays to treat customer data with respect, to keep user experience front-and-center, and to continuously invest in your brand.